Born in 1975 in Caen, Marie-Agnes Gillot began her studies at the Paris Opera Ballet School in 1985, where she was immediately placed in the fifth group. She completed all her studies and enrolled, despite the difference in age, in the corps de ballet in 1990, at the age of 15. Quadrille in 1991, she is promoted to Coryphee in 1992.The same year, she becomes finalist in the 15th International Dance Competition in Varna (Bulgaria). Marie-Agnes Gillot then takes part in all the important productions of the Paris Opera Ballet, tours around France and abroad (Asia, Russia, Italy, Germany, USA, the Lebanon). She is promoted to Sujet in December 1994, at the end of the annual competition of the Paris Opera Ballet. 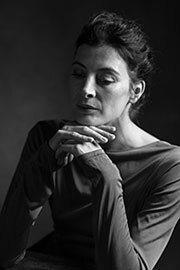 In 1997, following the Opera's show, Dancers-Choreographers, Kader Belarbi gives her a role in his Salle des pas perdus. She has received the Prix du Cercle Carpeaux in 1997 and the Prix du Public awarded by l'AROP (Association pour le Rayonnement de l'Opera de Paris) in 1998. Promoted to First Soloist in January 1999, her repertoire has expanded to include the roles of Diana in Sylvia and Hermia in A Midsummer's Night Dream (John Neumeier), Concerto Barocco, Apollon Musagete, Jewels/Rubies and Diamonds, Violin Concerto, The Prodigal Son, Symphony in C, The Four Seasons, Liebeslieder Walzer (George Balanchine), In the Middle Somewhat Elevated, The Vertiginous Thrill of Exactitude, Woundwork 1 and Pas./parts (William Forsythe), Swan Lake, Raymonda, La Bayadere and Don Quixote (Rudolph Nureyev), Annunciation and Casanova (Angelin Preljocaj), Le Jeune Homme et la Mort, Clavigo (created in 1999) and Notre-Dame de Paris (Roland Petit), 9th Symphony, Le Concours and Webernopus V (Maurice Bejart), the leading female roles in Signes (Carolyn Carlson), Appartement (created by Mats Ek in 2000), The Cage (Jerome Robbins), Paquita (restaged by Pierre Lacotte in 2001), Stepping Stones (Jiri Kylian), Wuthering Heights (created by Kader Belarbi in 2002), AndreAuria (created by Edouard Lock in 2002). At the end of the performance of Signes (Carolyn Carlson) on 18th March 2004, she is named Danseuse Etoile. Afterwards, she performs the pas de deux from Daphnis and Chloe (George Skibine) at a gala in homage to Claude Bessy, the title role in Mats Ek's Giselle, Glass Pieces (Jerome Robbins), Etudes (Harold Lander), The Dream of Medea (Le Songe de Medee) (created by Angelin Preljocaj in 2004), and the role of Aurora in Sleeping Beauty (Rudolph Nureyev).